Fresh herbs have been dazzling the world since ancient times, revered for their healing properties as well as for their culinary flavors. I started my Italian herb garden outside my kitchen door years ago. There I was surrounded with garden tools of the trade and a wheelbarrow full of tiny three-inch pots of rosemary, oregano, thyme, sage, mint and parsley. As I put them in the ground and carefully sealed their tender roots with dirt, I thought about how long a wait it was going to be to see them thrive and mature. I had plans for those herbs; they would go into so many dishes from savory to sweet besides providing a beautiful garden display that attracted bees, butterflies and the occasional frenetic hummingbird. I depended on them to do their thing and willed them to grow into lush bush-like plants. The first year was slow but then after their root systems were established, they started to reward me with their bushy look, delicate flowers and distinctive flavors. Just rubbing the leaves with my hands released their volatile oils that stayed with me all day and I was ready to respond with a cook’s zeal. Most herbs are perennial plants but they are also tender and need to be treated with care. Most like well-drained sandy soil and a sunny location. 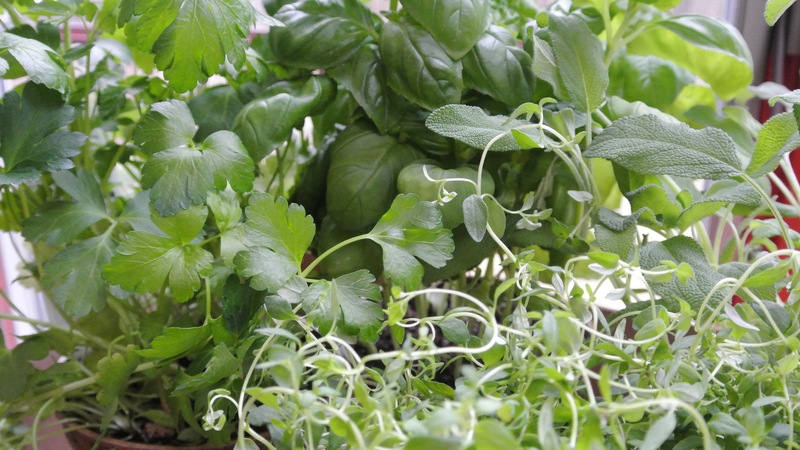 Many herbs like basil, oregano and parsley benefit from frequent pruning, allowing the plants to bush out. Some like mint and chervil can tolerate damp conditions. Of course, herbs can be container plants as well. In Italy, almost every apartment balcony teams with terracotta pots of basil, oregano, rosemary and mint. Italians use fresh as opposed to dry herbs, Fresh herbs have volatile oils while dried have been stripped of their oils during the drying process. 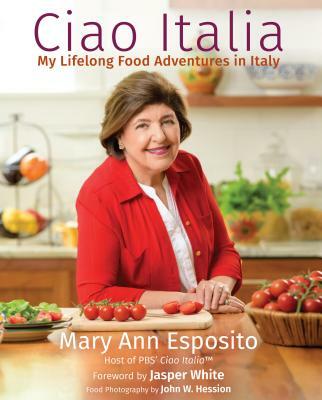 Just think about some of the classic regional dishes that depend on fresh herbs for flavor and give character to a dish like basil for tomato sauce and pizza margherita, mint for Roman style artichokes or rosemary for succulent porchetta or sage for veal saltimbocca. To get the best flavor, gather herbs in in the morning before the heat of the day and use them that day if possible. Place the stems in a container of cold water while harvesting them to prevent the leaves from wilting. Bring them indoors and trim the stem ends before placing them in a glass of water. Do not wet the leaves; wipe them with a damp paper towel. Basil is especially prone to unsightly dark watermarks on the leaves. When cooking with herbs, add them to some foods like soups and egg dishes towards the end of the cooking cycle since heat destroys their oils. For soups, stews or braises, make a bouquet garni of herbs like sage, rosemary, thyme and parsley and add them to the pot halfway through the cooking process and for baking, snippets of herbs like peppermint and lemon verbena are a delicious surprise in pies, cookies and cakes. Saltimbocca means 'jumps in the mouth' and is a classic Roman dish of veal cutlets, flavored with prosciutto and fresh sage. Heat the olive oil and 1 Tbs. of the butter in a large sauté pan over medium-high heat. When the butter is foaming, set two of the cutlets in the pan and sear without moving until golden brown, 3 to 4 minutes. Flip them over and cook until firm to the touch and cooked through, about another 3 minutes. Transfer to a platter and repeat with the other two cutlets. Add the sage leaves and prosciutto to the pan and cook until crisp and slightly browned, about 1 minute. Transfer to a plate lined with paper towels. Pour the fat from the pan, set the pan over high heat, and add the wine. Boil, scraping up any browned bits from the bottom of the pan with a wooden spoon, until the wine is almost completely reduced. Add the chicken broth and boil until liquid is reduced by half, about 3 minutes. Return the cutlets to the pan, stir in the remaining 1 Tbs. butter, and cook for 1 minute to heat through. Serve the cutlets with the sauce, sprinkled with the sage and prosciutto.